Sheikh Shomali "how can we create a better Britain and a better world?" Virtus lectures pique our learning in vital and risky issues for our society; oppression, bullying, abuse, privilege, rank, altered states. How do we manage to shift from the present polarisation of religions in Britain? Is there a strategy to help us overcome the polarisation of religions and our current British post-modern and consumerism? Are there clues to creating a culture of respect, friendship and collaboration in order to create a better Britain and a better world? 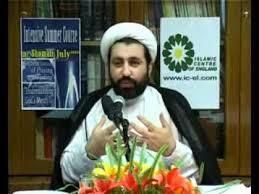 Dr. Mohammad Ali Shomali is a graduate of the Islamic Seminaries of Qum. He has also both a BA and an MA in Western Philosophy from the University of Tehran. He has earned his Doctorate in Philosophy from the University of Manchester. His publications include: Self-Knowledge (1996 & 2006, also translated into Malay, Spanish and Kiswahili), Ethical Relativism: An Analysis of the Foundations of Morality (2001, also translated into Malay), Shi‘a Islam: Origins, Faith & Practices (2003 & 2010; also translated into Spanish & Swedish), Principles of Jurisprudence: An Introduction to Methodology of Fiqh (2006). He is a co-editor of Catholics & Shi’a in Dialogue: Studies in Theology & Spirituality (2004), Catholic-Shi’a Engagement: Reason & Faith in Theory and Practice (2006) and A Catholic-Shi‘a Dialogue: Ethics in Today’s Society (2008). He is currently the resident Imam and director of Islamic Centre of England. The lectures take place on a monthly basis from October to June at 7.30pm in the Abbey Church.